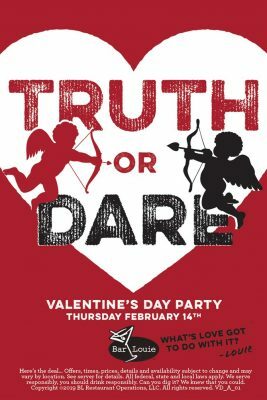 Join Bar Louie on Thursday, February 14th for their Truth or Dare Valentine’s Day Party! They will be featuring their two new drinks, The Chocolate Truth and Diablo Dare. Stay and party throughout the night with Late Night specials from 10pm until close. See restaurant for more details.